It is hard to justify planned increases in the cash the assembly gets to spend, a committee of AMs have said. The budget for the National Assembly for Wales is increasing by 5.6% to £56.7m next year - above inflation and despite Welsh Government funding only rising by 1.1%. The finance committee said future increases should be reined in. The assembly commission, which is led by senior AMs, said it would respond to the report in due course. 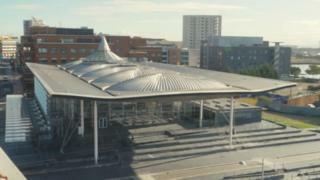 In a report, the finance committee said that "at a time when many other public services in Wales are facing extensive and continuing real terms cuts, it is hard to justify any increase in the assembly's spending". In the remaining years of the assembly term, which ends in 2021, the report said the commission's budget "should not be in excess of any changes to the Welsh block grant". The assembly has ring-fenced £700,000 next year to prepare the way for a new assembly building. But AMs on the cross-party committee said the evidence presented to support this proposal was "weak". Despite the desire for a new building, £1.9m was spent on refurbishing the ground floor of Ty Hywel. "The committee questions why a short-term, less expensive solution was not implemented, prior to a new building potentially being built, which could have accommodated additional committee rooms," the report said. AMs also called for staff numbers to stay static in 2018-19. Numbers of staff increased from 446 posts budgeted for in 2017-18, to 452 who are currently employed by the assembly. "A functioning legislature is essential for a healthy democracy, but we are not immune to the austerity being felt by so many public sector organisations, including our hospitals and schools," said Simon Thomas, the committee's chairman.